The VELscope’s blue light “excites” molecules (called “fluorophores”) deep within the layers of oral mucosal tissues. In turn, those fluorophores emit their own light (fluorescence), in shades of green, yellow and red. The VELscope’s proprietary filter makes fluorescence visualization possible, by blocking reflected blue light, and by enhancing the contrast between normal and abnormal tissue. False positives occur when a diagnostic test mistakenly signals the presence of disease. The VELscope system is NOT a diagnostic test, and does not, consequently, generate false positives. 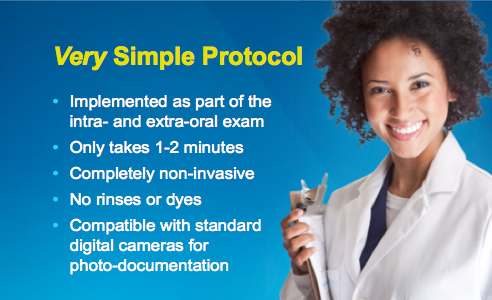 As an adjunctive visualization tool, the VELscope helps dental professionals discover a wide range of unhealthy tissue in the mouth, including oral pre-cancer and cancer. Our mission is to provide you an opportunity to achieve optimal dental health, comfort, function, and appearance. By understanding your unique needs we help you develop a treatment plan to accomplish your goals at a desirable pace. Our ongoing commitment to quality, honesty, integrity, and service helps us form successful, long-term relationships. To support this union, we continually broaden our skills in all areas of dental care and incorporate the latest technology. To schedule your no-cost consultation and discuss the results you can expect, contact our office. We are happy to help.